Pomdrakpa Sonam Dorje ​​​was born in 1170 in Dri Dampa Chöchuk in Central Tibet. He could read by the age of five and at the age of nine he received the transmissions of Chakrasamvara and Hevajra from Nyen Lhakhang Gangpo. When he was fourteen he heard the fame of the great master, Drogon Rechen. Upon hearing his name, Pomdrakpa was immediately overwhelmed by a special meditative experience, during which he had a vision of red dakinis who prophesized Drogon Rechen as his root Lama. Within a matter of days he departed and went to visit Drogon Rechen. He received the full monastic ordination and was named Sonam Dorje. Pomdrakpa practiced with great diligence for many years under Drogon Rechen, experiencing many visions of wisdom deities. He also had a vision of the First Karmapa, who gave him important instructions. Pomdrakpa also received teachings from Tsangton Dorje Gyaltsen of Kathok Monastery in Kham. He later took over and renovated the monastery of Tasho Pomdrak, which became his seat and the source of his most commonly used title. Pomdrakpa received the full Kagyu transmission from Drogon Rechen and became a gifted master. Before passing away, Drogon Rechen told Pomdrakpa that he and another disciple, Lodrö Rinchen, were now the masters of the teachings, who could each hold this lineage. He added, “My disciples can guide themselves! Among them, I have great hopes in you and in Lodrö Rinchen. Between you two, your activity will be greater. The labours of your disciples and those of their disciples will be great.” In so saying, Drogon Rechen predicted that Pomdrakpa’s lineage would prosper even more during the time of his disciples and in the future. 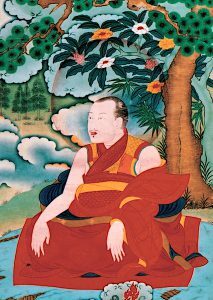 Pomdrakpa’s activity of benefiting beings flourished as predicted, and he identified and passed the lineage transmission on to the Second Karmapa, Karma Pakshi.